While on a trip earlier last month, I experienced everything there was to rave about the nation: its rich (and rightfully-weird) culture, nice people and glorious food - a topic I could go on about at length, but that would have to be a read for another day. More relatably, however, is how admirable their marketing practices are. My previous visits to the country reinforced the 'customer as God' marketing concept they're most well-known for, with products invented for every possible use (no matter how specific) and guiding instructions provided for the easiest of tasks. Even their enthusiasm in expressing gratitude towards their customers - not for their purchases, but simply for entering the store - is something most of us can learn from. 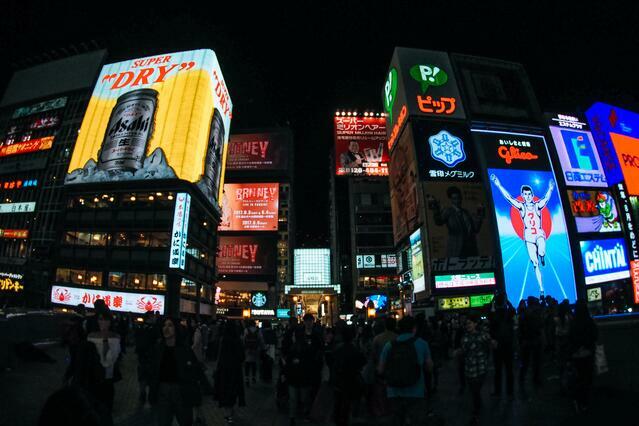 This time, I made a mental note to uncover more about the marketing methods of the Japanese, and I realised there's so much more to them than what I'd thought I already knew! The Japanese have one of the most high-context cultures in the world. It's not only natural for them to understand meaning through the context of the conversation, non-verbal cues and between-the-lines interpretation, but it's also very much expected. 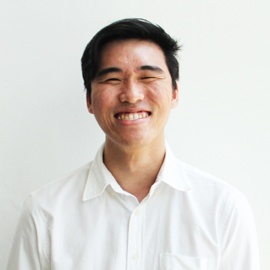 In this case, being fluent in Japanese really means mastering the art of deliberate silence, eye contact, postures, frequency of glances, and even the rate at which you chew your food. But how does this delicate form of communication translate to marketing material? It struck me that the use of human faces - emotions at its most elaborate - was heavily prevalent, which was intriguing (and somewhat scary - imagine faces staring at you from every conceivable angle). Even though I understood no more than 20% of the characters on each poster or flyer, I could still get the gist of the underlying message (sorta). Much like the non-verbal way the Japanese communicate in person, their use of written text only forms part of its full message. Who would've thought this dramatic ad was for lozenges? 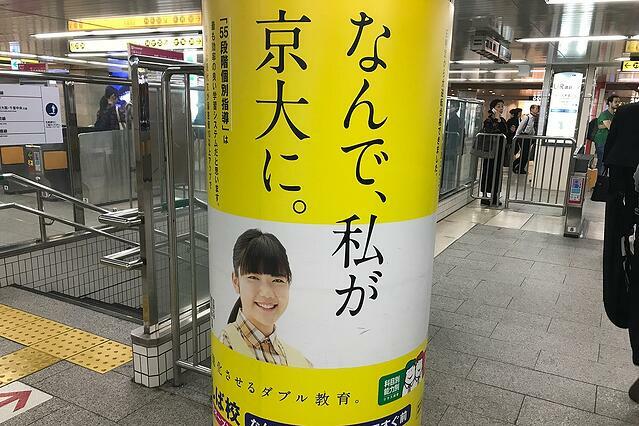 Take the ad above for example - its caption loosely translates to 'I want to eat my favourite food, but my ulcer hurts', which is a situation we can all empathise with. It didn't need the usual imagery of grinding gears or declarations of effectiveness to get its message across; all it took was a girl with tears running down her cheeks. The act of showing, not telling is what speaks volumes (and probably would sell lots of lozenges too). Clearly an influence of their kawaii culture, the Japanese LOVE their mascots (also known as yuru-chara) - to the extent of having mascots for everything. 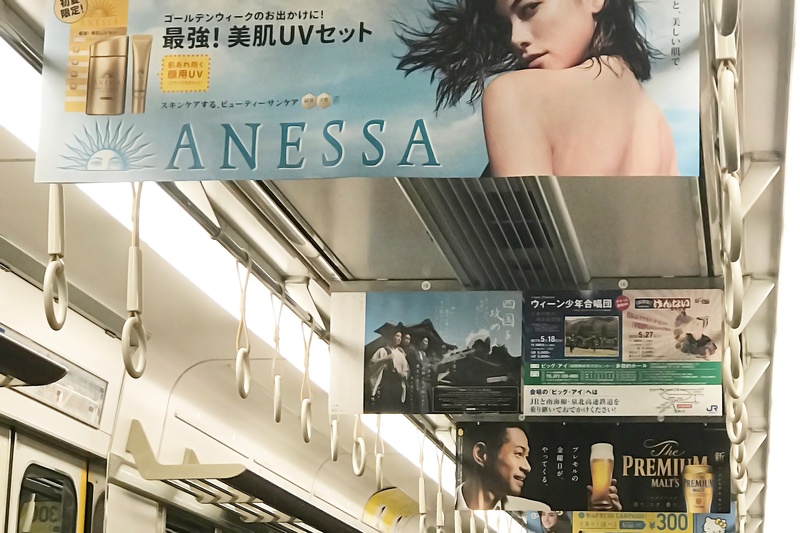 From video games, restaurants, police stations to government departments, prefectures and historical sites, there is a cute face and quirky personality attached to every possible entity. There are even mascot festivals, world-famous mascots with international superstar statuses, and even a Yuru-Chara Grand Prix, which pits 1,421 (you read that right) mascots against one another in the cutest popularity contest ever. 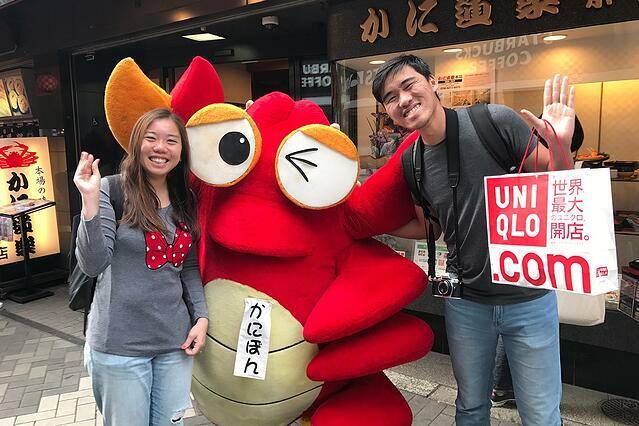 In my one week in Japan, I came across countless of such mascots - a winking crab, a samurai cat, a penguin in a santa hat, and other seemingly unfinished blobs. And it is precisely this amateurish, unfinished design that really ups their appeal - the more dumbed-down the mascot, the more kawaii and popular it becomes. Case in point? Kumamon (a blank-faced bear created by the government of the Kumamoto Prefecture), Funassyi (a pear fairy representing the city of Funabashi, Chiba) and Domo-Kun (a brown, furry monster representing Japan's public broadcaster NHK). "Just go to that penguin store, it's everywhere"
So, why the obsession with these adorable creatures? Aside from creating a more tangible image for brands (which works really well in kawaii-obsessed Japan), these little critters also help differentiate the brands from other similar competitors. 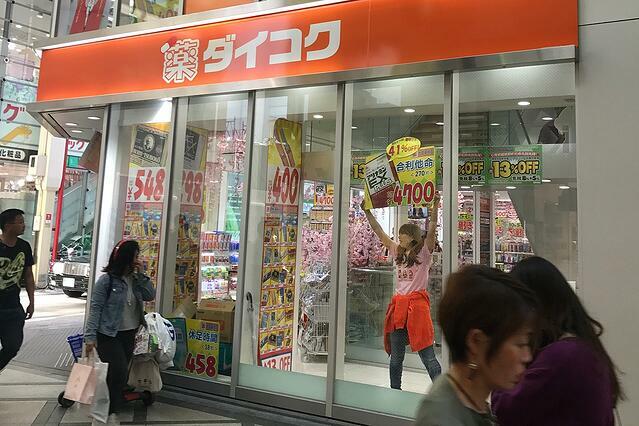 For example, discount megastores like Daiso, Don Quijote and Matsumoto Kiyoshi may carry pretty much the same stuff at competitive prices, but one store in particular really stands out to me, particularly as a foreigner. Because remembering 'the store with the fat penguin' is always much easier than trying to recall a lengthy name like 'Matsumoto Kiyoshi' (which has no mascot, by the way; just a logo with a Japanese character). While its younger generation has one of the world's largest internet penetration rates, the Japanese economy is still mostly made up of an older, ageing population. What results from this is an interesting blend of modernisation in traditional mediums such print and out-of-home media - which makes for a facinating marketing case study in a seemingly digital world. Out-of-home media, in particular, is evidently the most visible in this space-contrained country. 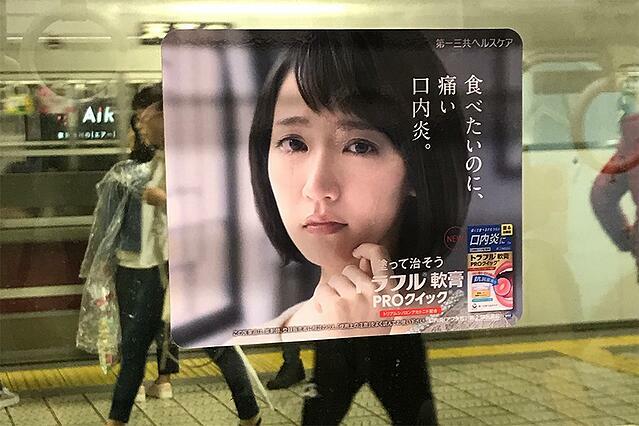 Not only does such advertising fill up every possible space in subway trains and stations, but also billboards, flyers and tissue packets. This results in a marketing message overdose at every turn. 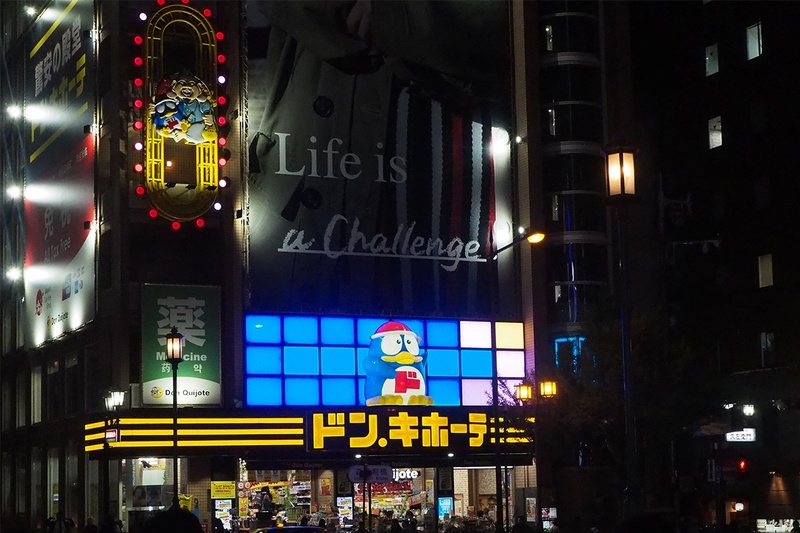 There are times, however that bigger isn't always better, especially if your billboard or advertisement is located right next to the iconic Glico man at Dotonbori. It's just phenomenal how this victorious runner has singlehandedly become synonymous with not just the Ebisubashi shopping street, but the entire city of Osaka in general. Nobody ever remembers the other billboards, right? Your brand may have the most well-designed marketing collaterals and the cutest mascot of all time, but even those wouldn't be enough to attempt standing out amidst the cacophony of other brands vying for your attention. Enter a guaranteed way to stand out - that is, by literally standing out. The focal points of what these promoters repeatedly communicated were consistent: discounts, low prices, bundle deals. While I had originally thought that quality and craftsmanship were highly valued in the decision making process, I realised that the younger generation was more content with discount stores and bulk purchases. 1st floor: promotions. 2nd and 3rd floors: also more promotions. 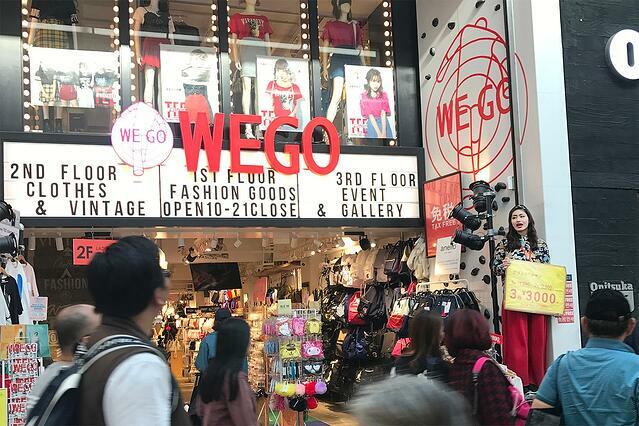 These behaviours of the modern Japanese consumer shouldn't come as a surprise, really - what with the economic slowdown, a reluctance to conform to society, and added responsibilities of caring for ageing family members playing a part in this mindset shift. This made me realise that no matter how definitive a certain group of consumers seem to be, they'd still evolve over time! While sandwiched between commuters in the subway, I couldn't help but notice what those around me were doing on their phones (since I do have an height advantage over most people). I may not have been able to understand the content - and I don't think it counts as peeking if I can't read Japanese - but I could tell that they were furiously tweeting away. A quick Google search then uncovered an unexpected statistic: that Twitter, the social media platform most of us (or me, at least) has distanced away from, actually has more users in Japan than Facebook and Instagram - combined. What has Twitter done so successfully in Japan to ensure its widespread sustainability within the country? 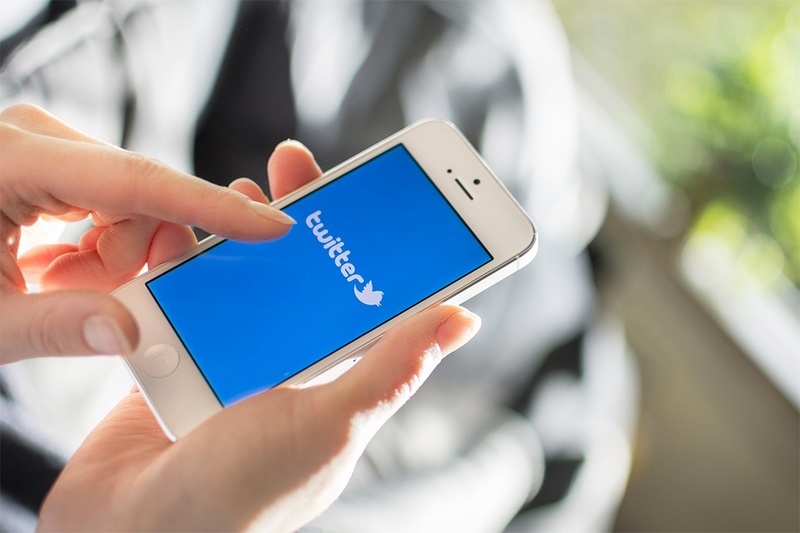 As a result, Japanese users are able to extract a far greater deal of information from a single tweet, as opposed to those who tweet in English. The social media platform also plays an important role in disseminating vital information in times of disaster, like during the 2011 Earthquake. Specific hashtags were set up for evacuation details, aid requests, medical information and more, with users being able to provide support to the hundreds of thousands affected, when the telecommunication infrastructure was overloaded with calls and messages. A very encouraging case study indeed, and one that proves Facebook isn't the be-all and end-all across all geographical markets. Marketing practices around the world differ because of cultures, habits and preferences of people. It's even more interesting to note that certain marketing tactics we take for granted in our own country might be a marketing case study in others, and vice versa. It was refreshing for me to observe these cultural intricacies and nuances while on this trip, and it taught me to not take our own experiences as de facto marketing practices. That said, I'm sure there were many more lessons I might've missed out on, mostly because I may have been... slightly occupied with various culinary experiences. If you've got some of your own experiences to share, feel free to let us know in the comments! Or, I could just plan for another Japan trip soon - for research, you know.